An award-winning temporary house for disaster victims has been put to the test by Tropical Cyclone Marcia and has passed with flying colours. Designed by three Central Queensland University students, Angus Hughes, Jessica Kahl and Mattison Rose, the temporary house has successfully withstood the extreme weather offered by Tropical Cyclone Marcia and has remained in-tact. Located in the outskirts of Rockhampton, the multi-level timber Pallet House is made almost entirely from cast-off timber, and has now officially survived three cyclones, including the recent one in Queensland, which was larger and stronger than previous weather events. "The size of the pallets dictated the size of the house which is three pallets high, three pallets wide and five pallets long,”Angus Hughes, one of the designers, told CQUniversity's Be magazine. “I saw a documentary about the use of pallets for housing refugees in Haiti and that gave me the idea. I got advice from engineers and used the CAD design software at Uni,” Hughes said. Completed with discarded roofing iron and iron pipe stumps, the house has no running water, but is connected to the property’s electricity supply. 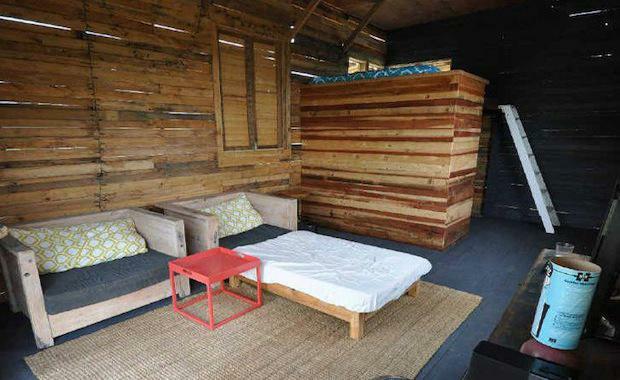 As reported by Architectureanddesign.com.au, Angus Hughes, Jessica Kahl and Mattison Rose designed The Shelter Project, a social enterprise that uses industrial pallets to create homes that can be erected in a disaster zone area in minimal time.